For grocery or convenience stores, restaurants or other types of businesses looking for the best in Orlando Commercial Cooler services, look no further than All Temp AC and Refrigeration—we have the skill-set, track record, tools and technicians that customers in Orlando are looking for to keep their coolers running efficiently. We know that your business depends on your equipment running optimally and consistently, and because of that, we offer 24 hours a day, every day of the year, emergency services. We can fix whatever type of cooler you have, whether glass-front or walk-in, and provide the maintenance needed to reduce breakdowns. We can also help with the installation of new equipment, removal of old equipment or instruction on how to use whatever type of cooler you have. Because commercial coolers run constantly, and because they are subjected to constant customer or employee use, they are more susceptible to breakdowns than almost any other type of cooling unit. To keep them running properly and to avoid outages, the coolers require periodic maintenance. We offer a wide variety of maintenance contracts customized to suit your particular needs—periodic TLC not only reduces downtime due to malfunctions, but it helps reduce utility bills by ensuring that your equipment is running as efficiently as possible. 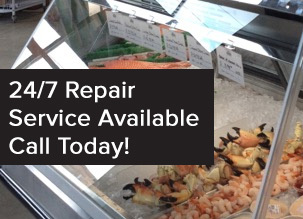 We’ll replace worn parts, test component function and clean and calibrate your cooler so you won’t have to worry about whether it will be there for you and your customers all year long. If you happen to have a non-standard cooling need, we also offer Industrial & Process Type Refrigeration, in which we can build a custom cooler for you to meet whatever unique needs you may have. We use cutting-edge technology and advanced refrigeration options to provide you with inventive solutions to your specific cooling needs. Once your new system is in place, we offer ongoing maintenance and repair to ensure it runs as you expect. Customer satisfaction is our #1 objective at All Temp AC and Refrigeration because we want you to be happy with the services you receive and for that reason we offer a 100% satisfaction guarantee on all of the work we do. Call All Temp at 407-857-7800 (Orlando Area) or 813-630-9400 (Tampa area) today!